Notice that the fraction shown in the first set of brackets must be positive. 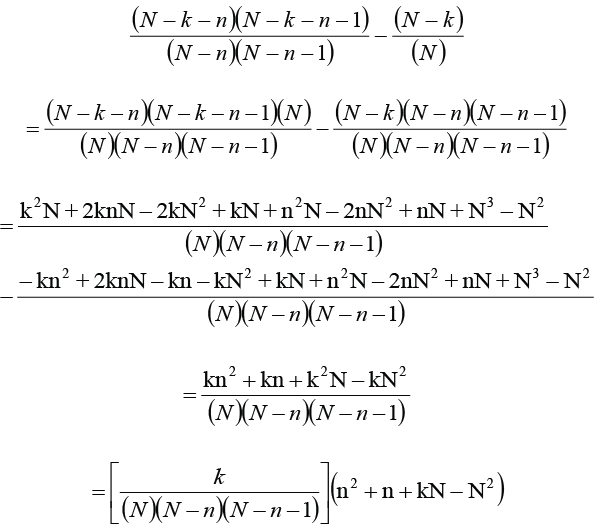 We can set that aside for now since what we’re really interested in is when this formula is equal to zero. Notice that the fraction in the left hand brackets must be positive. 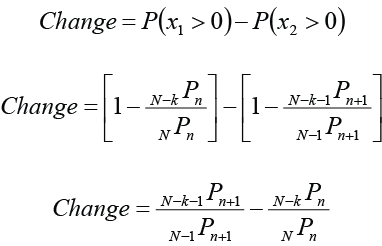 Again we can set that aside for since what we’re really interested in is when this formula is equal to zero. When < 0, the odds decrease. When = 0, the remain unchanged. When > 0, the odds increase. Hopefully, all this math will put a useful tool in your designer’s toolbox–and all arose from an off-handed comment I made about probability. 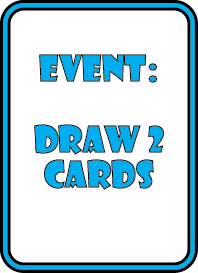 What do you think of “draw 2 cards” cards? Have you incorporated them into your designs? What did you learned from the experience? Do they improve a design or weaken it? Share with your fellow readers in the comments below. And if you’re enjoying what you’re reading, create an account with WordPress and follow this blog. If you keep reading, I’ll keep writing. The next questions was, how do these results vary from one game to the next? With questions like these, it’s often useful to explore the extremes first. Imagine a deck which only contains one special. In this case, playing a special means that none remain and you have 0% probability of holding another. Not very useful but worth noting. We’ll bring this up again later. Imagine a deck of seven cards which contains two specials in which you are dealt five cards. If you play a special, you draw the rest of the deck and thereby guarantee that you’re holding the other one. You have 100% probability of holding another. This is actually more useful to note than Extreme #1. Strategy in deckbuilding games like Dominion frequently revolves around building an engine that maximizes your chances of drawing all of your deck every turn. So we have one extreme case in which the odds drop to 0%, and another extreme case in which the odds jump to 100%. What’s going on in the middle. That’s what I set out to discover next. To avoid ridiculous cases like Extreme #1 or Extreme #1, let’s set out a few assumptions. First, we have a deck of size N and your starting hand size is n. This deck contains a quantity k of special “draw 2 cards” cards. To avoid the ridiculous extremes, let’s agree that the deck contains at least two specials and that the deck is large enough that after playing the special and drawing the extra two cards, there will be at least one card remaining. How much do the odds change when your opponent plays a special card and thereby draw two cards? The quantity of specials which could be in her hand decreases by one. The quantity of cards you have not seen decreases by one. The quantity of cards in her hand increases by one. The deck has 60 cards. 10 of these cards are “specials.” Players are dealt 6 cards to begin. When a player uses one of these specials, the odds drop by approximately 6%. You are playing Dominion. Your deck has 25 cards. 10 of these cards have “Draw+2.” Each round starts with 5 cards inn hand. When you play one of these cards, the odds you are holding another drop by approximately 3%. The principal purpose of this blog is to bring you living debates from game design and our solutions to them. An interesting one occurred recently which drove me on a bit of a mathematical quest. Having taken the computational plunge, it’s now time to share with you fine folks my results. So it happened that we were playtesting a card game. Luther on his turn played a card we’ve seen in a huge number of games; he played the special “draw 2 cards” card. So far, so good, right? We’ve seen this card many times in many different games. Our postgame discussion led to a debate over whether playing this special meant that he was more likely or less likely to be holding another. We began to explore the possibilities. Luther holds more cards, that increases the odds but he also played one of these specials and that reduces the odds. It was hard to tell from the outset. We did the calculations. This particular game has a 99 card deck and 9 of these cards are the “draw 2 cards” special. Players are dealt an 11 card hand. In the interest of time and space, I elected to assume that you are already familiar with the mathematics of permutations. If you find yourself wanting a refresher, there is a solid description at Math is Fun. So there was roughly a 67% chance that he received a special in his opening deal. There is now roughly a 71% chance that he holds a special. We have our result. Not only did the odds go up, the odds rose by nearly 4%. It’s nice to know that the odds go up by 4% in this particular game but what about all the other games with similar conditions? What about later in this same game, once a few cards have been seen? Is there some point at which the odds slip? When is that? These questions propelled me to dig deeper. Our next installment will seek to answer these questions.